The Squarespace Form Block is a great way to collect data from customers easily and with nice-looking forms. Squarespace has a native MailChimp integration, but sometimes you want your data to connect with other services, like Active Campaign, Zapier, or ConvertKit. Squarespace's Name Field collects both the First and Last Names and stores them as a single value. There are circumstances when you may need the First Name and Last Name separated. In some Mailing List services, like Active Campaign, you also need the fields in a particular order. Active Campaign requires the Email Address to be in the first column, followed by the First Name, then Last Name. 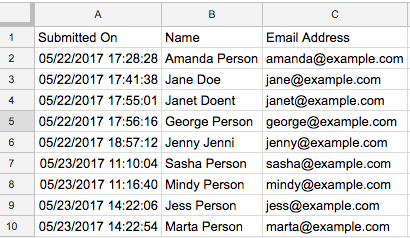 You can automate the process of data manipulation, moving the Email field, or splitting the Name field, using Google's ArrayFormula function. I named my worksheet AC and it's where I'll manipulate the data for Active Campaign. Now, whenever the Squarespace adds a New Row with the completed fields to the SQS worksheet, the ArrayFormulas on the second worksheet will automatically update with the new data. When you are importing this data into Zapier, Active Campaign, or another service, be sure to specify the "new" (second) worksheet with the correctly calculated data.